The holidays are the one time of year when we have frequent house guests. Even if you aren’t a regular ‘dinner party’ kind of family, if you ARE going to host people for dinner at your home, Thanksgiving is probably the time you do it. And in order to make those guests feel at home, you want your house to feel welcoming. Typically we focus on the obvious rooms, like the dining room or living room, but it is the little touches that will always stand out. And one place you may be overlooking is your guest bathroom. I not only decorate my bathroom for the holidays, I also make it more guest friendly. Or having a bathroom that is really clean, since nobody likes a dirty bathroom. After cleaning the toilet you can use a long term cleaner/freshener. It is a simple way to maintain a clean toilet bowl without having to constantly scrub it. Plus it keeps the bathroom smelling nice every time your flush. Removing toothpaste splatter and fingerprints from the mirror is a piece of cake with glass cleaner. mean that your guests don’t have to be embarrassed to ask for them if they need them or have forgotten something at home. 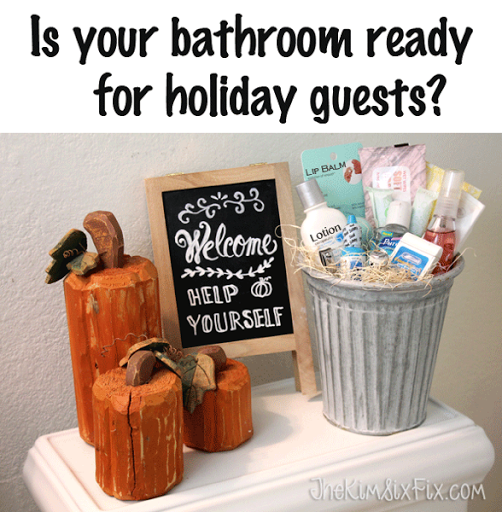 Imagine how special your holiday guests will feel when they walk into the bathroom and see just the thing they wished they had brought with them. Finally, don’t forget the sink! Changing out your hand soap for a seasonal scent is always a nice touch. It is the little things that make a big impact. And your bathroom can be one of them!